Robert Jefferson “Jeff” Keate was born in Vancouver, British Columbia, Canada on March 10, 1912. His full name and birthplace was found in British Columbia from the Earliest Times to the Present, Biographical Volume 3 (1914), which profiled his father. According to the book, his parents were William Lewis and Ethel Anderson and his older brother was William Lewis. Keate’s birth date is from his naturalization record at Ancestry.com and the Social Security Death Index. In the 1930s Keate moved to Grand Rapids, Michigan (his father’s birthplace) to attend college. Next, he enrolled in the Chicago Academy of Fine Arts and graduated in 1936. He was listed in the 1936 Grand Rapids City Directory: “Keate Robt J cartoonist r215 Paris av SE”. In the 1939 directory he had replaced Robert with Jeff. According to American Newspaper Comics (2012), Keate was the writer on the strip Filbur McFudd, which was drawn by Leland S. McClelland. It debuted November 1, 1937. Keate was named twice along with several cartoonists in a 1938 or 1939 issue Judge magazine. 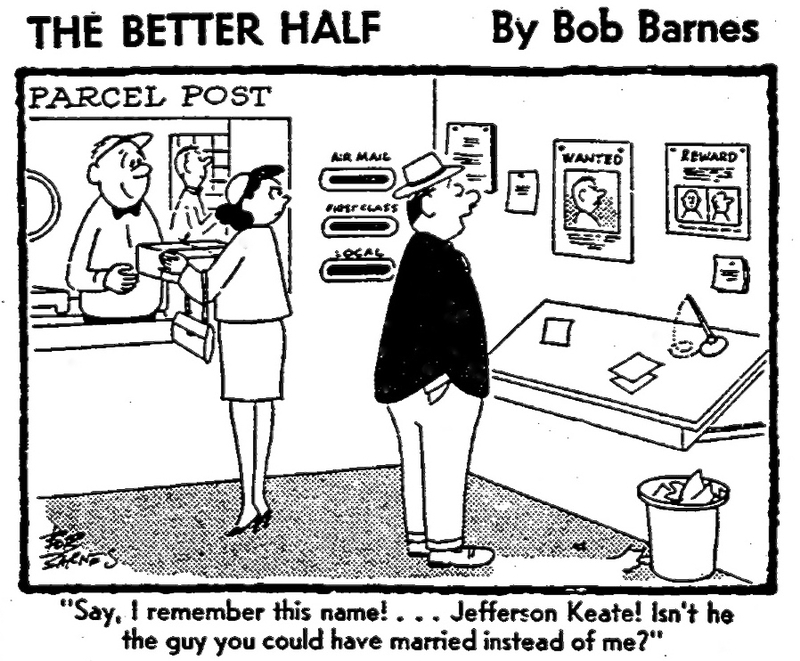 She admitted she once was quite enamored of ex-Vancouver cartoonist Jeff Keate. That was when he was writing gags, didn’t own a typewriter of his own and used to sit up all night using the machine in the office of the Lawson YMCA in Chicago, where he lived. 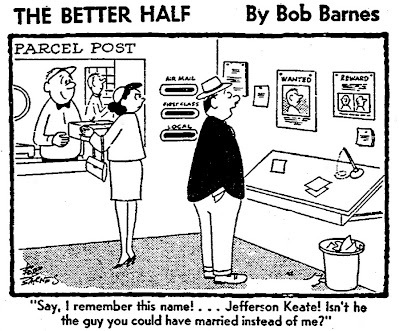 My next relationship was with a cartoonist called Jeff Keate, who specialized in sports cartoons on which he’d work all night long. When I’d arrive for the breakfast shift at the Lawson building at six in the morning, he would be in a nearby office mailing out his night’s Work. That’s how we got acquainted, and soon we began dating…. A short time later, when I returned from a visit to Lima, Jeff dropped me for a girl who he was probably screwing. We’d nevertheless remain lifelong friends, and he would end up marrying three times. The first wife reportedly met with his family’s approval, but thereafter it was downhill all the way, and his last marriage was to a butchlooking pianist whom I met while we were both performing on the Dutch cruise ship Prinsendam. She was about six foot one and had the face of a bulldog. I’ve still got letters from Jeff in which he wrote, “Oh, if I had only married you when I was young…” He realized what a big help I would have been, especially with my interest in comedy. 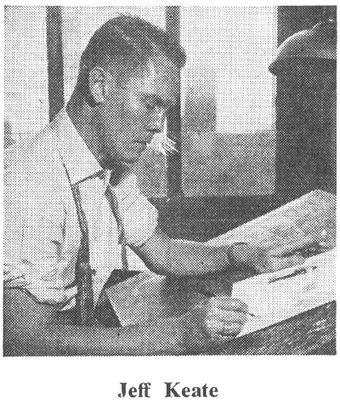 Keate sold cartoons to various periodicals. He was the writer on Dotty Dripple, which ran from June 26 to October 14, 1944. His career took off when he moved in 1945 to New York City. A 1946 Manhattan City Directory listed him at 321 East 43rd Street. Jeff Keate, 8 Maple Grove, Westport CT 06880. Cartoonist since 1936. Interested in general situation and timely gags, sports gags (all sports in season) for “Time Out” sports panel and “Today’s Laugh,” general situation panel. “Be Funny. No puns. No oldies. No old hat situations.” Has sold all of the major publications over the past 30 years. Currently doing syndicated newspaper cartoon panels for Publishers-Hall Syndicate and Chicago Tribune-New York News Syndicate. Pays 25% commission. Bought close to 200 gags from freelancers last year. Holds unsold gags for “approximately 2 years unless gagwriter requests gag back sooner.” Returns rejected material immediately. Enclose SASE for return of submissions. Some of his comic book credits are here, and an interest in jazz is revealed here. A photograph of Ben Thompson, Keate, and Mort Walker at the 1965 Connecticut Cartoonists Gold Tournament is here. At some point Keate moved to the high income environs of Connecticut. The 1954 Westport City Directory listed him and his wife, Margaret, at Chapel Hill Road. The date of their divorce is not known. The Connecticut Marriage Index at Ancestry.com said Keate married Evangeline L. Boychuk in Westport on July 27, 1967. They divorced July 25, 1984 in Florida. His third divorce was also in Florida on July 22, 1993. Public records at Ancestry.com show that he resided in Florida, at various times, in Nokomis, Orlando and Venice. According to the Social Security Death Index, Keate passed away May 22, 1995. His last known residence was Nokomis. There are a few mistakes in your profile of Jeff Keate. Specifically about the wives. His second wife, who was a pianist for Holland America Lines, was Vangi Keate, 5;10", ...my mother, and was well known as a beauty. She was also friends with Phyllis Diller. They (Jeff and Mom) would have dinner with her whenever she was in town. I cannot imagine her referring to mom as "butch looking." Thanks for your comment. The Diller quote about Jeff's wives came from her book, Like a Lampshade in a Whorehouse. It was her recollection. The name of your mother, Evangeline, was taken from the records at Ancestry.com. Ancestry.com subscribers can post comments/corrections about names in its database. 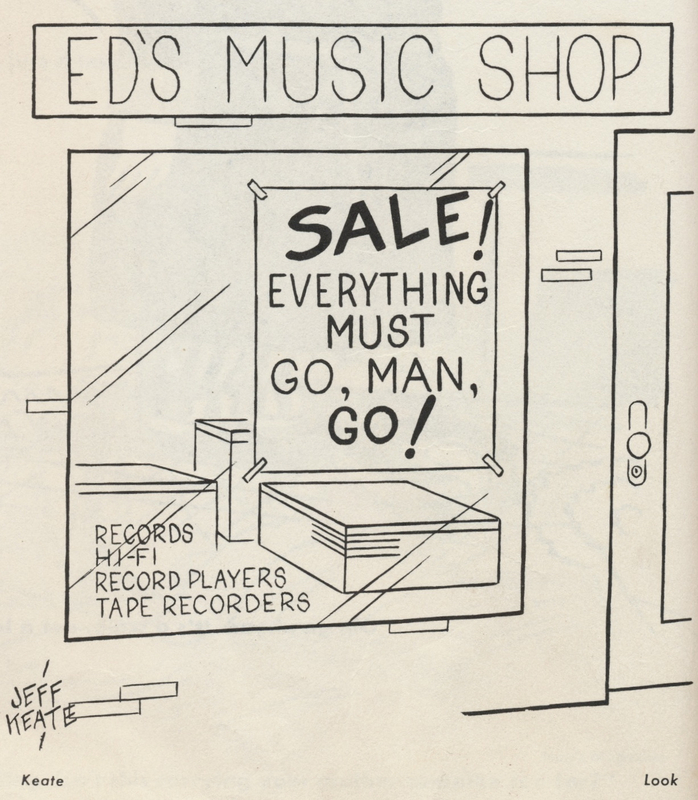 I have a photo of a cartoon by Jeff Keates depicting my father. He played baseball in the U.S. In the 1950s. Can someone there provide me with an email address where I can send the photo? I would like to get more information about it. Thank you. i just purchased around 400 of jeff's original artworks from a guy in florida who bought a lot of it at an estate sale...it is an amazing wealth of information about life during these times..i consider jeff to be a great american comic illustrator and writer and i feel blessed to have had the opportunity to gather so many of his works...and that he used to date phyllis diller just makes it even cooler!!! He was my uncle as he married my mom, Annamae Scott's sister, Margaret. I used to watch him create cartoons when we'd visit Westport back in the mid 60s. He'd allow my brother and I to sit in his studio as he created. I reconnected with him after the divorce when he moved to Florida in the 80s. Michael J. Vassallo (Doc V) on his Facebook page, The New York Sunday News Comics History Group, recently discovered that the Country editions of the New York Sunday News in 1950-51 added 8 additional pages of comics not found in the Home edition (the one that was microfilmed way back then). This included two new strips it seems found no where else, including a dog humor comic by Jeff Keate called Rufus.